The Game Boy Advance was released in 2001 and was a portable follow-up to the Game Boy line boasting 16-bit graphics and sound. 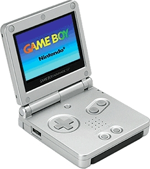 The system was redesigned as the Game Boy Advance SP in 2003 with a new look clamshell design, rechargable battery, and backlit screen. In 2005, a third iteration, the miniscule Game Boy micro was released. Regional release lists of games for the Game Boy Advance. Please note, these lists are currently incomplete. Information on all first-party Game Boy Advance hardware and accessories.